On 14-15 February 2015, the St Valentine’s Day weekend, your church, congregation or parish is invited to take part in a national campaign, For the Love of …, which recognises that everyone loves something that is threatened by climate change. It asks people to share what these things are, and to join together to demand climate action, for the sake of all the things that matter most, both here in Scotland and further afield. For a list of events taking place over Valentines weekend click here. 1. Explore in worship our love for God’s creation, using resources specially written for Sunday 15th February. This material has been written by Trevor Jamison (Environmental Chaplain to Eco-Congregation Scotland) and Richard Murray (Scottish Episcopal Church). You can download it here (PDF file) or view it online here. 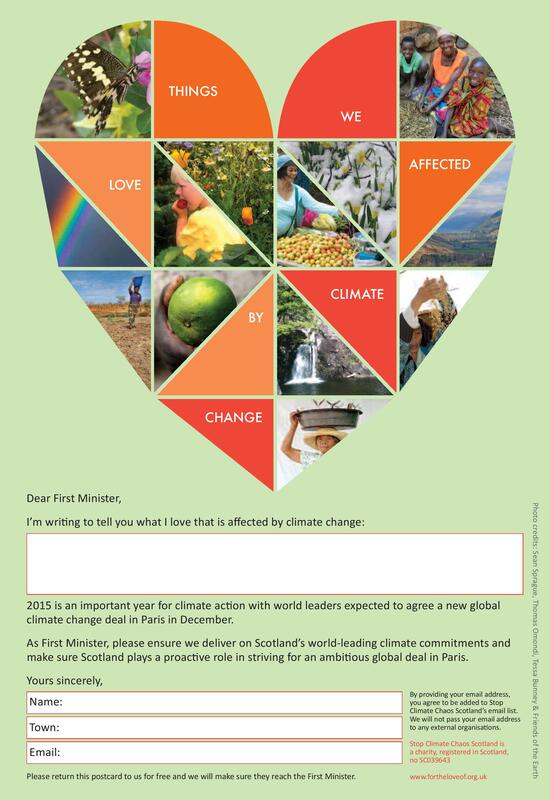 The For the love of… campaign comes from Stop Climate Chaos Scotland (SCCS), a diverse coalition of 60 organisations in Scotland campaigning together on climate change. Members include faith groups such as the Church of Scotland, the Scottish Episcopal Church, Christian Aid, SCIAF, Tearfund, Eco-Congregation Scotland, A Rocha, the Salvation Army, Methodist Relief and Development Fund and the Iona Community. A resource pack to help people organize local events, either independently or related to Sunday worship can be found here.